Recently, my sister-in-law Fränzi gave me this little bucket of dried pear paste. Often it's used as a filling for the classic Birnenweggen or Birnbrot (either Lözarner, Toggenburger, or Glarner ) or this, the delicious Toggenburger Schlorzifladen (try saying that ten times fast). The Toggenburg region is thought to have historically been home to many pear trees. Farmers would dry a portion of their fruit and store it in a large wooden chest to use throughout the winter months. Later, some of this fruit would be processed, sometimes with water and sometimes with wine, to make the Schlorzi, a mixture similar to the bucket of pear paste that Fränzi gave me. 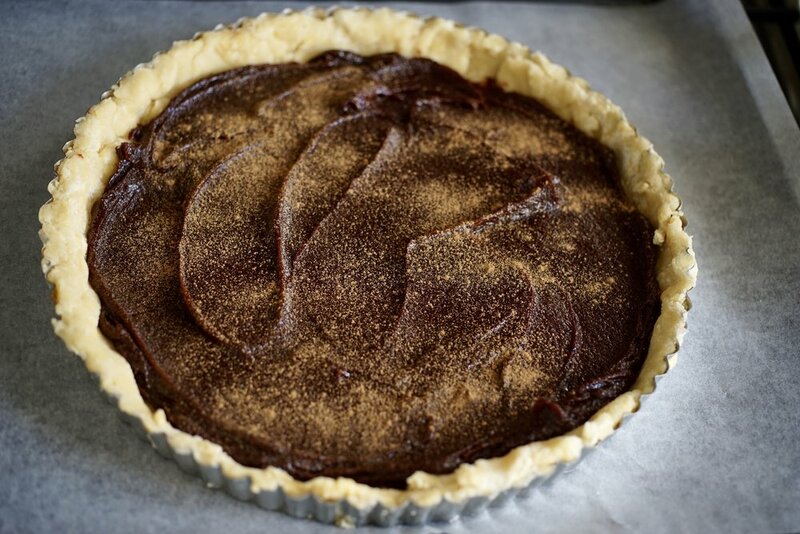 Fladen is just one of the Swiss German words for tart, like Wähe. Hence Schlorzifladen. Schlorzifladen was customarily made in the winter and exchanged on New Year's Eve, or Hüslinacht as it was known in Toggenburg, when neighbours would visit each other and share a piece. 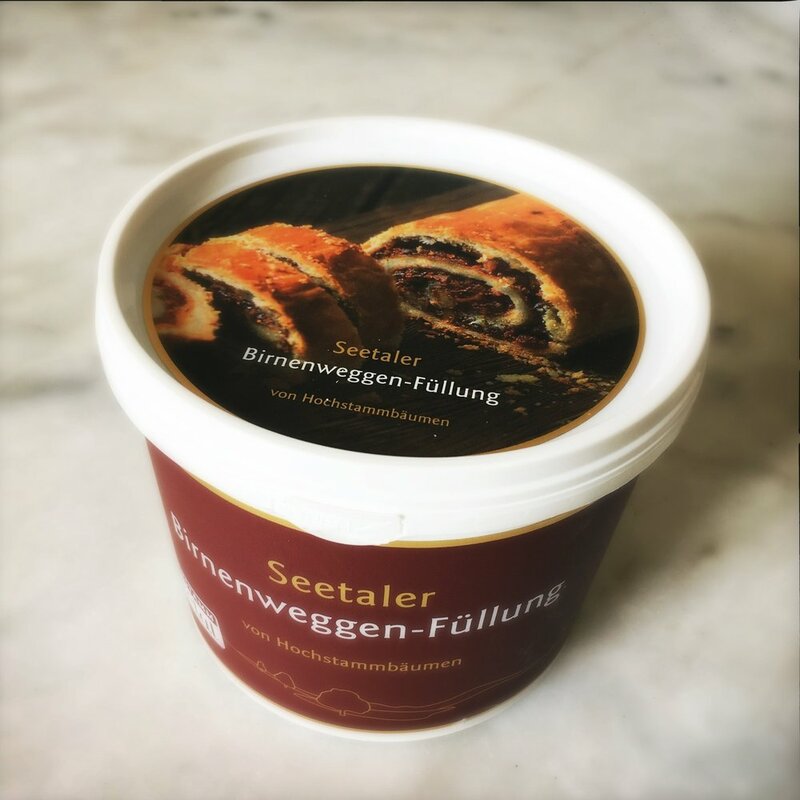 Although today the Schlorzifladen is perhaps most associated with Toggenburg, it was also traditionally baked in Appenzell and given as a gift to household staff, and from bakeries to their best customers. Winter is still its most popular season, but Schlorzifladen is now made year round and is particularly loved by tourists who hike and holiday in the region. The mark of a fine Schlorzifladen is a uniformly dark golden top layer—the darker the top, the more fresh cream it has inside (mine is not quite dark enough, I think). It is a cinch to make when you have the filling (you can buy this ready-made at Mirgos or Coop), but if you don't and you have some dried pears at hand, you can pretty easily make the Schlorzi yourself (recipe below). Rub the cold butter into the flour mixture until you get pea shaped clumps. In a small bowl, whisk together the egg and water, then add this to the flour mixture. Gently mix until it just comes together, then gather it up, wrap in plastic, and press down into a disc. Let cool in the refrigerator for about 30 minutes. Mix the birnenweggen filling with the shot of kirsch (if you make your own schlorzi you can skip this step, as the kirsch is already added). The cinnamon will be used to dust the filling once it is spread on the pastry. In a large measuring cup, whisk together the eggs, cream and sugar. Roll out your cooled dough and use it to line a round tart pan of approximately 28 cm / 11 in. 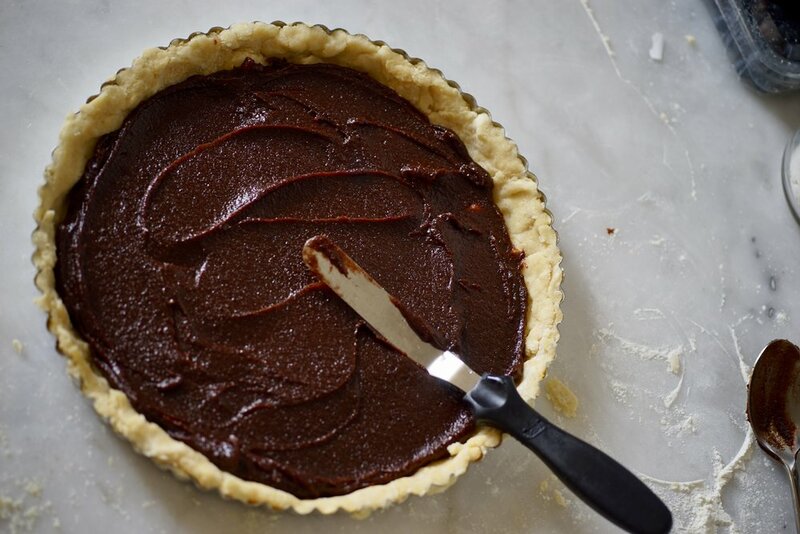 Stick the bottom of the tart a few times with a fork. Spread the birnenweggen filling or homemade schlorzi over the tart, then sprinkle with cinnamon. Place the tart on a parchment lined baking tray and pour the custard over top. Bake for about 45-50 minutes, or until the top is a deep golden brown. 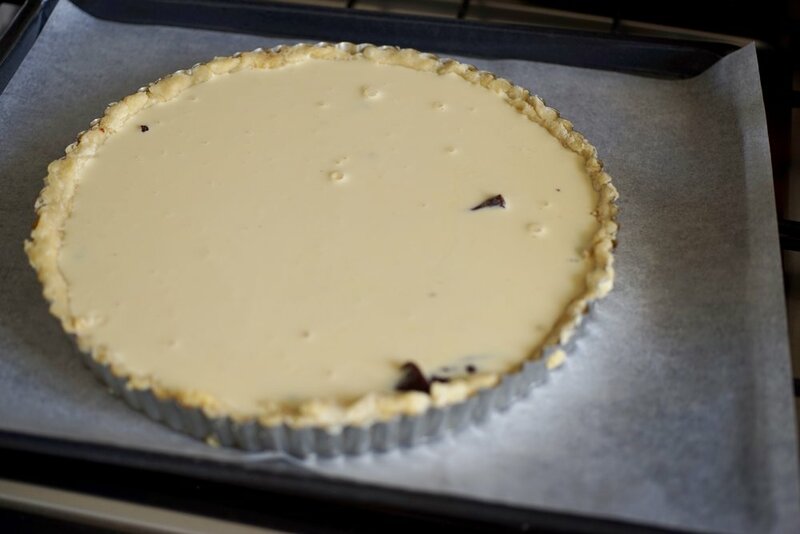 Always place the tart pan on a lined baking sheet BEFORE pouring the custard. Place the pears in a medium bowl and cover with water. Let sit for a couple of hours, until the pears are soft. Using a food processor or immersion blender, pulse the pears until you get a thick mass. Add the additional ingredients and mix well. You could probably use other dark dried fruits like figs or plums. Some recipes replace the water with red wine, do this if you are feeling adventurous. To get the perfect, spreadable consistency, you may have to add a bit more water (or kirsch, perhaps?) when you are blending.